2) Create a new pixel layer to paint on. 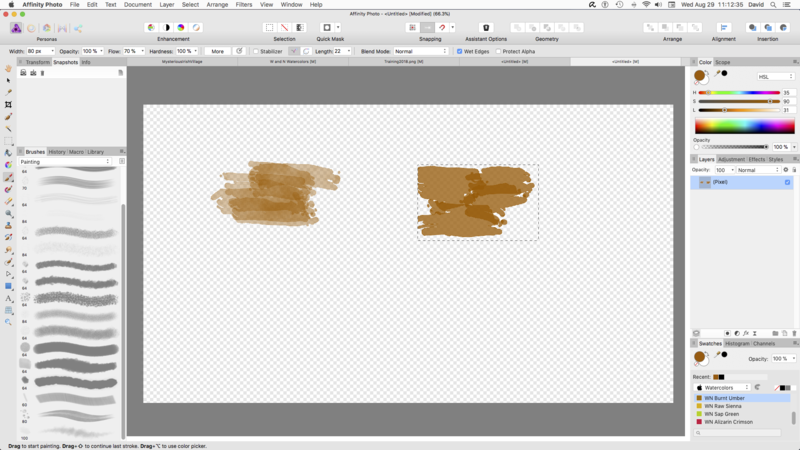 3)Using a default painting brush 4 (Watercolor Type Brush) paint several stokes. Let up mouse and paint over last strokes and notice level of transparency. 4) Use rectangle selection on same layer and use same brush and paint INSIDE selection. NOTICE THE LEVEL OF TRANSPARENCY HAS CHANGED AND IS DARKER. In Corel Painter I paint inside selections all the time. It is absolutely necessary. This seems like a bug. I used a mouse with no pressure sensitivity for demonstration purposes to rule out tablet issues. Notice opacity differences in attachment. I'm seeing the same thing and it doesn't look right to me either. If a mod doesn't pick this up and explain it, it would be worth reporting as a bug. Wet edges—sets the default 'wet edge' behavior of the brush. Select from the pop-up menu. Check Custom and apply a preset or custom profile, which subtly changes how watery the stroke appears. The 'wet edge' behavior builds paint up along the edges of your pixel brush stroke, producing a watercolor effect. That is because when I set the mode to "Nozzle" or "None" on a copy of the brush it doesn't look any different. 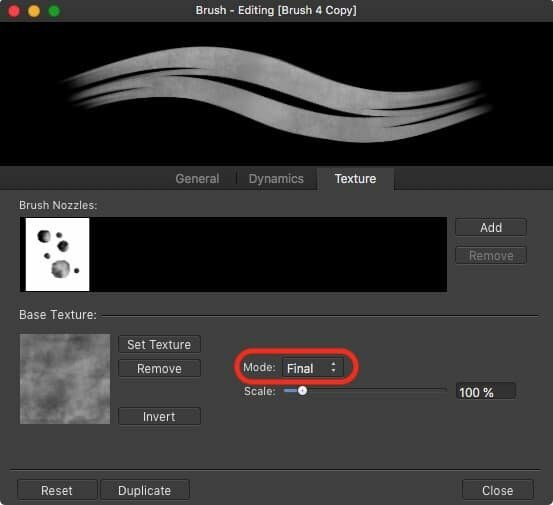 Mode—controls how the base texture contributes to the current brush. Select from the pop-up menu. None—the base texture is ignored, so only the brush nozzles are used. Nozzle—allows nozzles to build up brush color onto the base texture depending on flow and opacity response. Final—the density of the base texture is kept constant, with no nozzle flow or opacity response. Thanks for your report, I've managed to replicate this bug and have logged the issue with our devs, as well as moved this thread to Bugs on Mac. If you untick wet edges, I think your problem will be solved. Unfortunately with wet edges unticked, the transparency difference is worse. Interestingly enough this is not a bug that exists on Windows, it is Mac only, so the only workaround I can offer without changing the brush settings currently is to use a Windows machine, which is less than ideal! As best I can tell, it has something to do with the Base Texture Mode being set to "Final,"
Nice catch, thanks R C-R. You can change the mode to Nozzle and then drop the brush opacity to around 50% for a very similar effect to the original brush but with lesser texture, this will negate the bug when painting within a selection with this brush. Thanks for the responses. Painting inside a selection and then turning off the selection and painting with same brush/settings should be exactly the same without tweaking etc. This is definitely a bug. Appears to be on mac only. Turning opacity down works but should be only a temp workaround. The detail of the brush is also affected when you turn down the opacity.